A man carrying two spears and an ambatch shield (also used as a stool, headrest, container for tobacco and other objects etc.) turns slightly towards the camera as he makes his way across or on to a path. The path turns sharply to the right and then leads to a homestead that has a wall of large mud bricks around it. 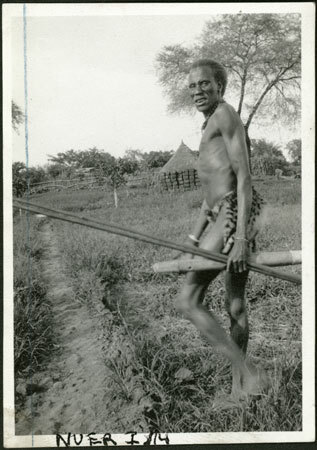 There are also other fenced areas nearby, suggesting that the Nuer locally resident to Nasir post were engaged in more sedentary horticultural activity, and possibly engaging in some work at the American missionary. Evans-Pritchard visited Nasir again during his short period of fieldwork in 1935. Research publication - The book plate spread is reproduced (Figure 16, page 329) and discussed (page 330) in B. Wolbert 'The Anthropologist as Photographer: the Visual Construction of Ethnographic Authority', Visual Anthropology , 2000, Vol 13, pp. 321-343. It is also reproduced (Figure 7, page 13) (and Wolbert's analysis criticised) in Christopher Morton, 'The Anthropologist as Photographer: Reading the Monograph and Reading the Archive', Visual Anthropology , 2005, Vol 18 (4) pp.1-17. Morton, Chris. "Nuer man on path" Southern Sudan Project (in development). 03 Jan. 2006. Pitt Rivers Museum. <http://southernsudan.prm.ox.ac.uk/details/1998.355.7.2/>.